Seven Palestinians were killed and at least 293 were wounded as thousands of Palestinian protesters gathered at the Gaza border for the second consecutive Friday. The Gaza Health Ministry identified two of the dead as Ahmad Nazar Mahareb and Majdi Shabat, raising the death toll to 29 since the series of protests -- called the "March for Return" -- began March 30. The demonstrations are expected to last until mid-May to mark the 70th anniversary of Israeli militias driving out some 750,000 Palestinians from their homes. The Israel Defense Forces said 10,000 Palestinians protested in five locations throughout the Gaza Strip, with many protesters setting tires on fire to prevent the military from identifying and wounding demonstrators. [post_ads]According to the IDF, protesters have thrown stones and Molotov cocktails at Israeli soldiers stationed along the border and burned U.S. flags and pictures of Saudi Arabia's crown prince. "Our forces will not allow any harm to the security infrastructure and the fence that protects Israeli citizens," the IDF said, adding they were using "riot disposal means and live fire in accordance with the rules of engagement." March leaders instructed Palestinian protesters to wear masks and not carry their cellphones to make it harder for Israel to identify them. Israeli officials have accused Hamas of orchestrating the protests, claiming that the group has attempted to carry out border attacks under the cover of protests. However, Palestinian organizers behind the march have denied these claims. "The march is organized by refugees, doctors, lawyers, university students, Palestinian intellectuals, academics, civil society organizations and Palestinian families," Asad Abu Sharekh, the spokesperson of the march, said. 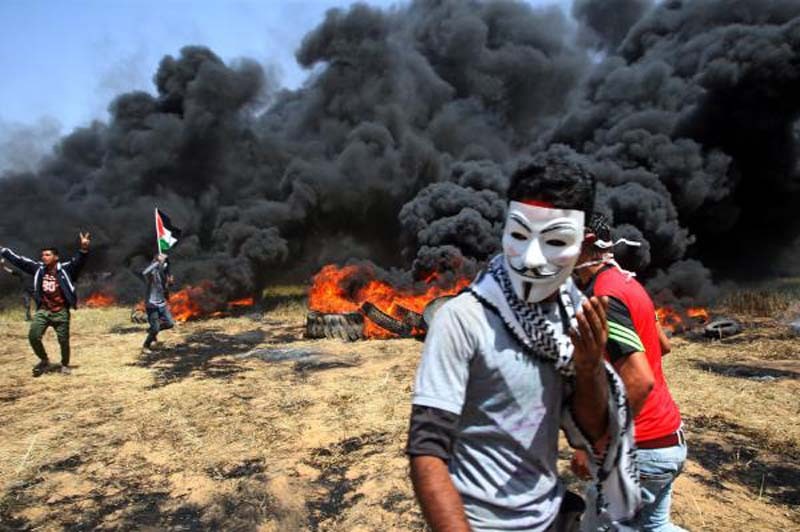 "These claims of Hamas being behind the protests is Israel's way to sabotage the idea of the march in order to justify its escalation against protesters."